If you have not been recruited or given a college cheerleading scholarship, many colleges still offer tryouts for their squads. 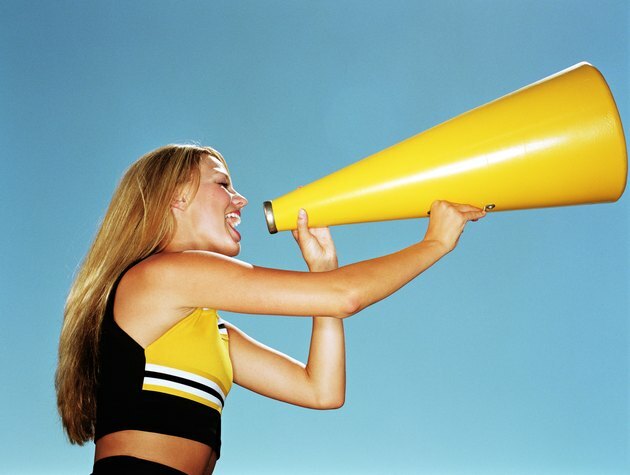 Tryouts for college cheerleading squads usually occur in May for the following academic year. Most colleges look at your current skill level as well as your potential skill level, previous experience, attitude and physical fitness. Tumbling skills are evaluated by all college programs. Florida State requires that potential cheerleaders be able to perform a standing back tuck, a back handspring back tuck, a toe touch back tuck and a round-off back handspring layout. Kansas University looks for many more skills, including a standing full, a standing back handspring full and a round-off back handspring tuck, full, or layout. Taking classes in tumbling or cheerleading will help improve your tumbling skills for tryouts. Potential squad members must be able to perform certain stunts in order to be eligible for most tryouts. Boston College requires a full twist cradle from all stunts; a walk-in/toss-hands extension; a walk-in/toss-hands heel stretch; and a transitional stunt. Georgia College has separate requirements for flyers and bases. Flyers must be able to pull three different body positions, a full down from extended one-legged stunts and a double down from prep level. Bases should be able to base any one-legged stunt with a full down, double down from prep level and do all basing positions -- right side, back base and left side. Physical fitness will be assessed during most or all college cheerleading squad tryouts. The physical fitness assessment covers your ability to perform the required elements, such as tumbling and stunts, as well as your physical appearance. Boston College states that they require above-average-stamina toe touches and a collegiate appearance. Georgia College states that all flyers will be weighed weekly. Florida State indicates that the way you carry yourself and the way you communicate with strangers, the coaching staff and any other students trying out will be considered. Rutgers wants all potential squad members dressed as if for a game performance at tryouts. Academic performance is considered at many colleges during tryouts. At Boston College, you must be a current student or have already been accepted to the college to try out for the squad. You must also have at least a 2.0 GPA. The University of Kentucky also requires at least a 2.0 GPA to try out if you are a current student. Incoming freshman who have been a member of a high school squad must have a high school ACT score of at least 22 combined with a grade point average of 2.5 or higher.